Earlier this work week my day was made by a sweaty smiling man wearing a tank top and a backwards baseball cap. At first, I did not recognize this smiling man walking my direction—although he did look familiar. As he entered my cubicle and took a seat in the chair next to me I nearly fell over because I finally figured out who he was. The last I had heard from him was a phone call thanking me for the follow up strategy I had suggested. He actually questioned me whether or not I remembered him, I could happily respond, “Of course I remember you!” You see this job seeker was exactly that—a true SEEKER. He enrolled in many workshops and absorbed all the information he could when he found himself unemployed. I did not recognize him at first because he looked quite different from what I remembered. When he initially was attending workshops at the career center he was looking for another office management position like he had held for the previous 20 years. He had worked in a small office surrounded by familiar settings for over 2 decades. Every time he entered my workplace for a job search or a workshop he was dressed for an interview—he appeared work ready. He wore dark rimmed glasses that would be the envy of all hipsters. His khaki pants and pressed button down shirt was always neatly accessorized by a pen in the left breast pocket. As he sat before me now I couldn’t help but express how different he now appeared. I noticed he was wearing an identification badge. As I asked what he had been up to, he explained that was one of the reasons that he came in. He said that about 9 months ago he had decided to give something different a chance. For the past year he had been working off and on for a staffing agency at a production facility. He stopped by to see me because he had just met with Human Resources and they had offered him a full-time position. His smile was very rewarding after a morning filled with frustrated job seekers. He took time to thoroughly thank me. He stated that it was a big step to go from a small office environment to a large production facility. He said it was a tad overwhelming at first. My heart could not help but swell when he let me know that this change actually had been very good for him personally. As he sat next to me he appeared to be a new creation. Though he was heaping accolades onto my efforts of encouragement, I had to let him in on a secret. He had actually served as an inspiration to me for over a year. He was quick to be thankful, pleasant, and courteous. He sent thank you cards to staff members for their help. He submitted résumé and cover letter documents to the online review center to receive assistance. He followed up with us and informed us of his progress. It was refreshing to meet someone who was aware of a need for help and wasn’t afraid to ask for it. Too many people in this life are too comfortable pretending like everything is fine, they would rather drown than admit that they don’t know how to swim. As someone who cares deeply about the efficacy of my words, it is always heartwarming to hear that the message intended was received and put into action. Over the past year the following 10 strategies I have endorsed in workshops were affirmed through the testimony of the smiling man in the tank top. Say YES to opportunities presented–if you receive an invitation, don’t hesitate—SAY YES! A constant prayer of mine is that hearts will be open to receive knowledge. The choices that are made after receiving that knowledge are beyond my control. I have had to accept that I am accountable for my own words and my faithfulness to reach out and share. I cannot force a job seeker to implement new strategies, I can only build them up to the point that they realize that they have a choice to SAY YES. 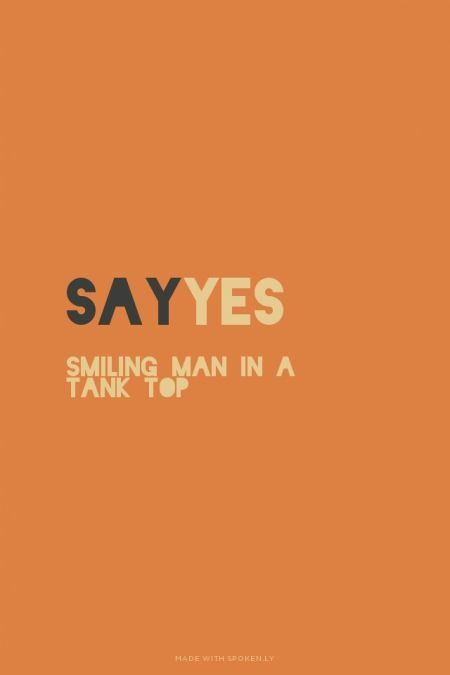 I am very thankful for the smiling man in a tank top. ← Double-dipping–party foul or party party? I have enjoyed hearing many success stories this week. One smiling man in a tank top never realized what an inspiration he had already proved to be.